Ceratodus - free! and Coominglah = free! Hello everyone we are still alive just out of internet reception. 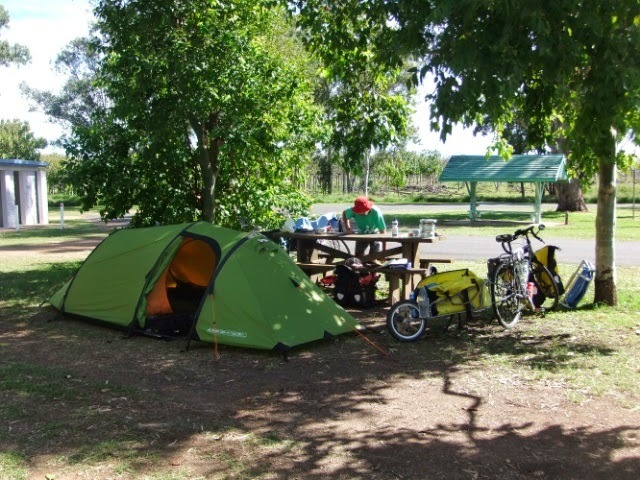 On Tuesday we rode a lengthy 11km to Ceratodus Rest Area which is a lovely spot on the Burnett River. It has toilets and drinking water so we decided to stay there on Wednesday as well but unfortunately there is not phone or internet reception. This rest area is a popular little spot and although not crowded each night there were at least 9-10 vans or campers there. We had a fantastic spot between 2 small trees and claimed a table too! if you look just above Neils head you will see a log that is running horizontal - that is typical of the trees around here with all the branches flowing down the river getting caught in the trees. They are very high - Neil would be under water and the rest area completely under water as was the Poonton tree farm next to us (lost most of his trees which are used for some sort of furniture) The bridge below would also be under water and you can see the river now! It is so cute and heavy so not suitable for the bike! 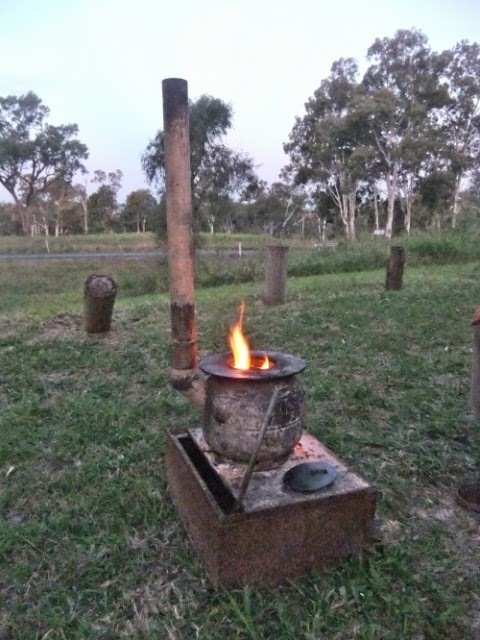 But it is a bit like a potbelly stove and is used for cooking and heating and is very portable! So we left early this morning as we have a tough day ahead. 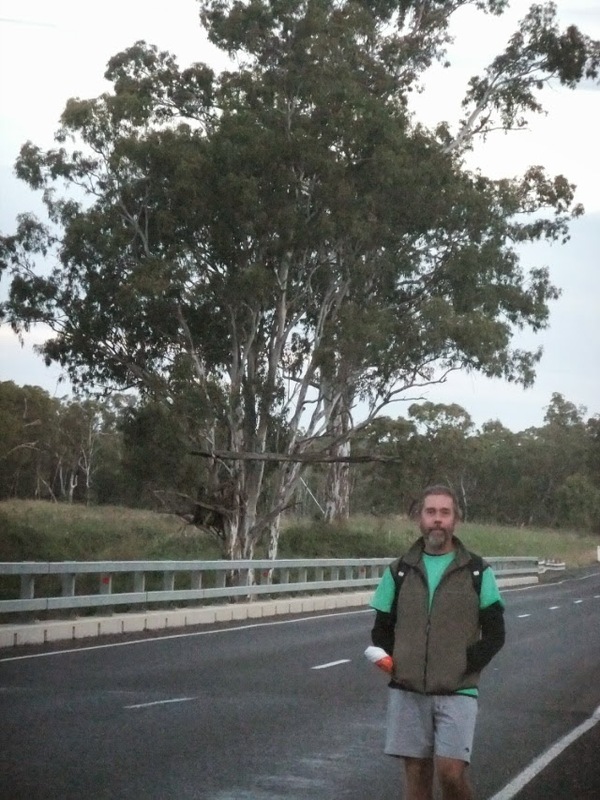 the road to Monto is a back road for most of the way - we found it on the map and is 13km shorter than going on the Burnet highway ... the turnoff is about 8km up the road from the rest area. 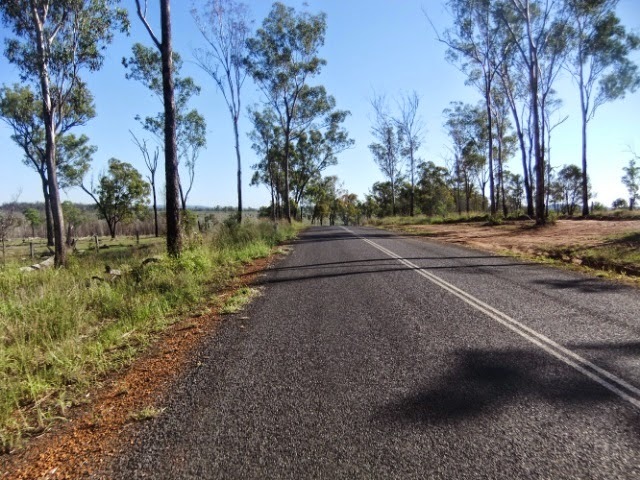 It is such a quiet road and is mainly used by locals it is the road to Wuruma Dam and for the bulk of it it is a single lane. Although after Abercorn there has been alot of roadworks (finished now) but it is still a single lane for the most of it ... the roadworks is mainly reinforcing the sides of the roads. The terrain is undulating although not us undulating as the Burnett highway. Some of the small hills can be little munters at times and were around 10%. At the junction to the road to Mulgildie we could see that the back road is sealed (unsealed a bit on the map we are using) so we decided to continue on this back road rather than join the highway. 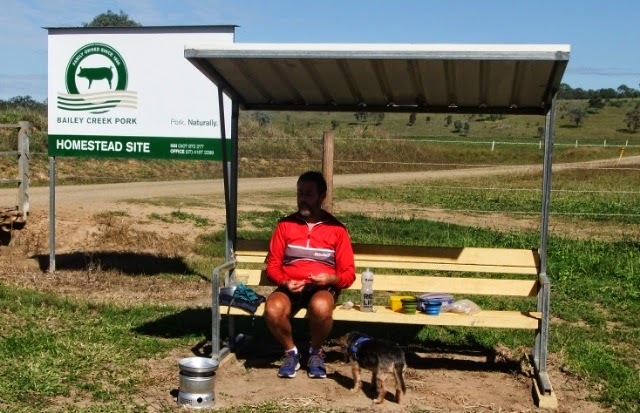 The Pig farm up the hill provided us with a seat for our cuppa! 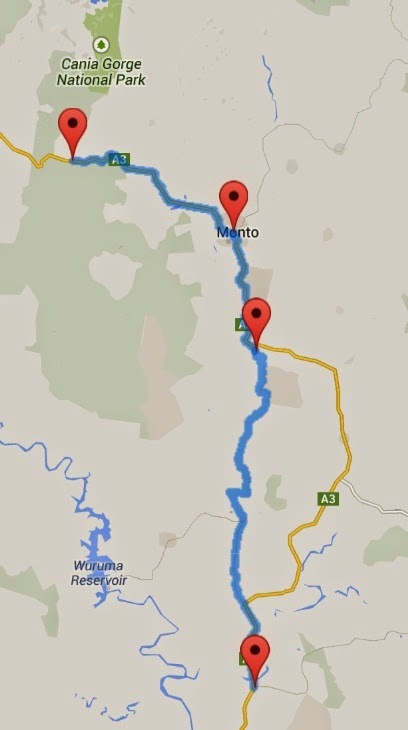 from here is is just another 14km to Monto where we are now. 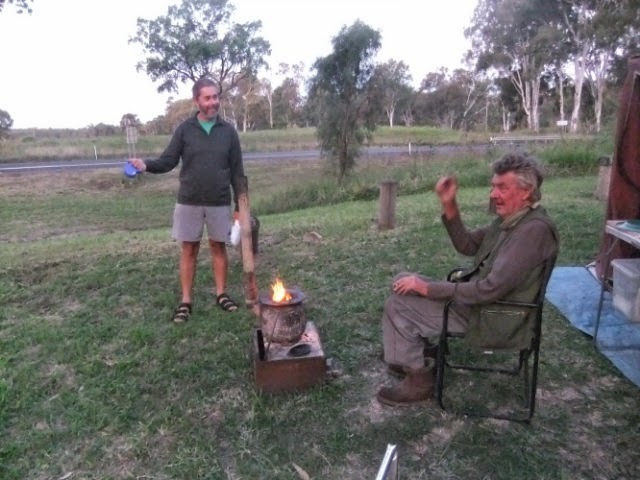 The bbq has a power point and so I thought I would blog from here as we are continuing up the Coolminglah range which is about another 21km to the top and I doubt if there is reception up there! It is about a 6km climb at 6% towards the end of the ride and at the top is the rest area! 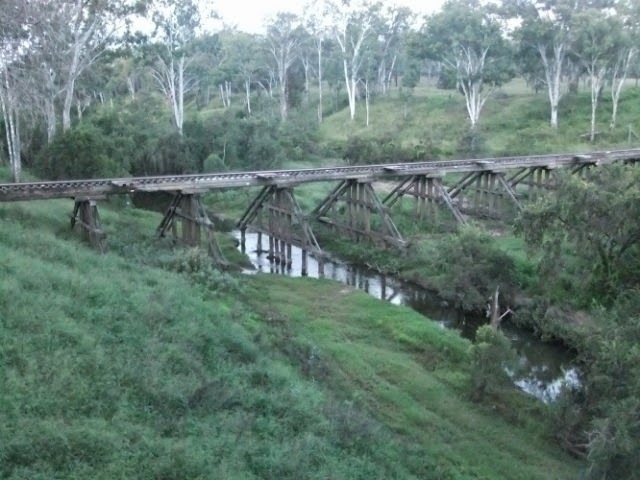 Tomorrow we ride to Biloela. Okay we do get internet reception at the top of the Coominglah ranges! so I will finish of this posting tonight. It was 18km from Monto and it was a 6km uphill for the final finale! There is nothing like a good solid hill to end the day. Basically the terrain was up and down to the Cania gorge turnoff and then it is a gradual incline for 2km and then the climb starts. It is steepest at the bottom but ridable and then evens out a bit and becomes a good gradient to climb. There is a little shoulder to ride in but there is not much traffic and what traffic there was was going just as slow as us ... quite a few b-double trucks that were loaded ... hence why they are going as slow as us! 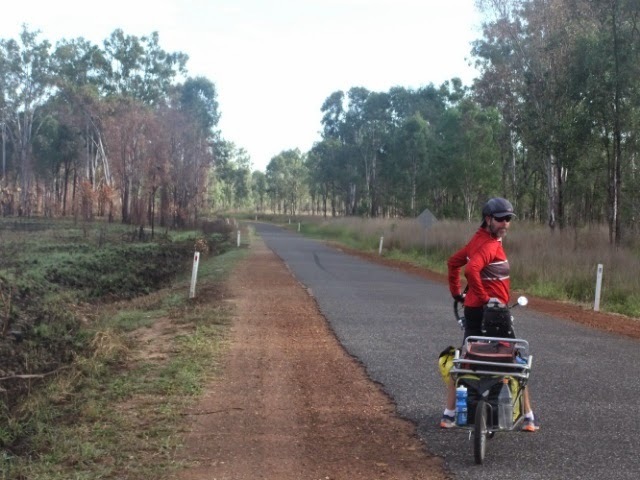 The rest area was closer than we thought so there might still be a little climbing first thing in the morning, so that will make our ride to Biloela longer but at least there is a down hill! There are not many here at the rest area, just 3 others, 2 off which were with us at Ceratodus last night! Should sleep well tonight. Did you know that you can earn cash by locking premium pages of your blog or website? All you need to do is to join Mgcash and add their content locking tool. Are you monetizing your exclusive shared links?